Some drinks are impossible to recreate. That first sip, besides the ingredients of the cocktail, also contained a little bit of the bar, the bartender, the dinner you had, the city you are in, and the company you are with, all on a certain evening, at a particular moment that will never happen again. That was exactly the case, on my last night in Tokyo, at the Bar Oak, while listening to a friend translate the story of the Tokyo Station cocktail as told by its creator and legendary bartender Hisashi Sugimoto. Tokyo Station, one of the most important train stations in Japan, recently celebrated its 100 year anniversary, and to honor the occasion, Bar Oak at the Tokyo Station Hotel asked Hisashi Sugimoto to return behind the bar where he poured drinks over 50 years ago. In many ways, Bar Oak reminded me of a Speakeasy, it was out of the way, hidden behind a door in a corner of the 2nd floor of the hotel. Sitting at the bar, we bowed and softly asked the bartender for a recommendation, smiling, he suggested his signature cocktail, Tokyo Station. 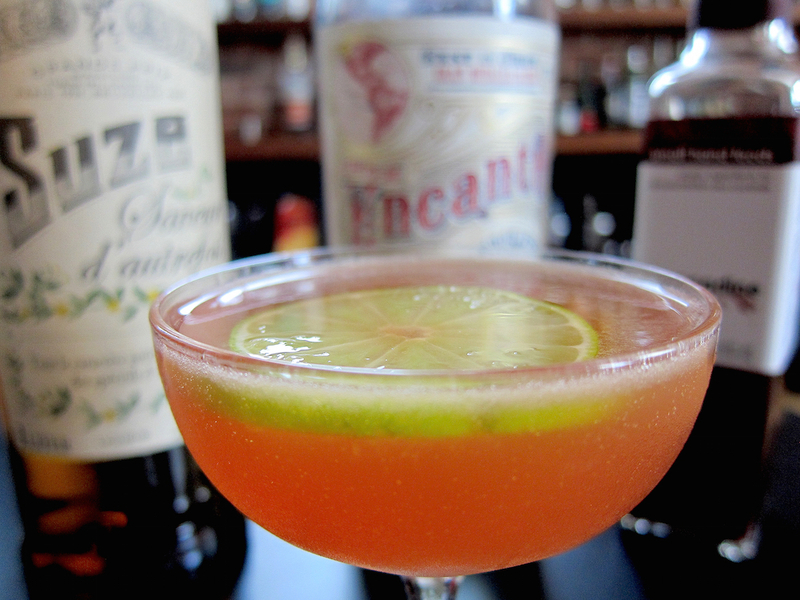 A combination of Gin, Sirop de Grenadine, Suze, and lime, Tokyo Station told the story of a journey. First, the color was reminiscent of the century old bricks on the west facade of the station. Then, the ingredients spoke to the international travelers who passed by everyday. And a wedge of lime that was squeezed and dropped in after the drink was half finished was used to divide the drink in two parts: the arrival of the train, and the departure. And tasting it reminded me of the bittersweet nature of travel, the sweet arrival, the bitter departure. To honor this experience, and the beautiful story that Mr. Sugimoto shared with us, I was inspired to create a Peruvian version of this cocktail. Now, since I didn’t have a recipe, I spent quite a few sessions in the Pisco Lab before arriving at something that reminded me of what I tasted on my last night in Tokyo. Presenting, a cocktail with Pisco, grenadine syrup, Suze aperitif, and lime, the Tokyo Station Pisco Variation — cheers to Hisashi Sugimoto and the story of Tokyo Station, I look forward to another sweet arrival and bitter departure at Bar Oak soon. Combine the Pisco, Suze, syrup, and lime juice in a shaker with ice and shake for 30 seconds to mix and chill. Served strained in a coupe and garnish with a lime round.